More than a year after the largest oil spill in history, perhaps the dominant lingering question about the Deepwater Horizon spill is, “What happened to the oil?” Now, in the first published study to explain the role of microbes in breaking down the oil slick on the surface of the Gulf of Mexico, Woods Hole Oceanographic Institution (WHOI) researchers have come up with answers that represent both surprisingly good news and a head-scratching mystery. In research scheduled to be published in the Aug. 2 online edition of Environmental Research Letters, the WHOI team studied samples from the surface oil slick and surrounding Gulf waters. They found that bacterial microbes inside the slick degraded the oil at a rate five times faster than microbes outside the slick—accounting in large part for the disappearance of the slick some three weeks after Deepwater Horizon’s Macondo well was shut off. At the same time, the researchers observed no increase in the number of microbes inside the slick—something that would be expected as a byproduct of increased consumption, or respiration, of the oil. In this process, respiration combines food (oil in this case) and oxygen to create carbon dioxide and energy. “What did they do with the energy they gained from this increased respiration?” asked WHOI chemist Benjamin Van Mooy, senior author of the study. “They didn’t use it to multiply. It’s a real mystery,” he said. Van Mooy and his team were nearly equally taken aback by the ability of the microbes to chow down on the oil in the first place. Going into the study, he said, “We thought microbe respiration was going to be minimal.” This was because nutrients such as nitrogen and phosphorus—usually essential to enable microbes to grow and make new cells—were scarce in the water and oil in the slick. “We thought the microbes would not be able to respond,” Van Mooy said. But the WHOI researchers found, to the contrary, that the bacteria not only responded, but did so at a very high rate. 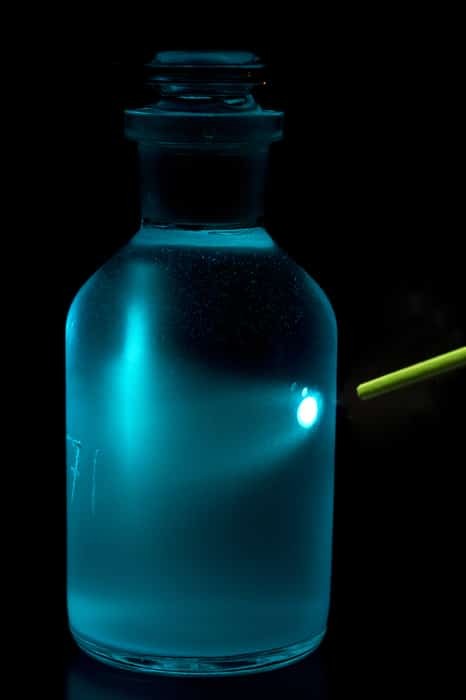 They discovered this by using a special sensor called an oxygen optode to track the changing oxygen levels in water samples taken from the slick. If the microbes were respiring slowly, then oxygen levels would decrease slowly; if they respired quickly, the oxygen would decrease quickly. Bethanie Edwards, a biochemist in Van Mooy’s lab and lead author of the paper, said she too was “very surprised” by the amount of oil consumption by the microbes. “It’s not what we expected to see.” She added that she was also “a little afraid” that oil companies and others might use the results to try to convince the public that spills can do relatively little harm. “They could say, ‘Look, we can put oil into the environment and the microbes will eat it,’” she said. Edwards, a graduate student in the joint MIT/WHOI program, pointed out that this is not completely the case, because oil is composed of a complex mixture molecules, some of which the microbes are unable to break down. Van Mooy said he isn’t sure exactly what fraction of the oil loss in the spill is due to microbial consumption; other processes, including evaporation, dilution, and dispersion, might have contributed to the loss of the oil slick. But the five-fold increase in the microbe respiration rate suggests it contributed significantly to the oil breakdown. “Extrapolating our observations to the entire area of the oil slick supports the assertion microbes had the potential to degrade a large fraction of the oil as it arrived at the surface from the well,” the researchers say in their paper. “This is the first published study to put numbers on the role of microbes in the degradation of the oil slick,” said Van Mooy. 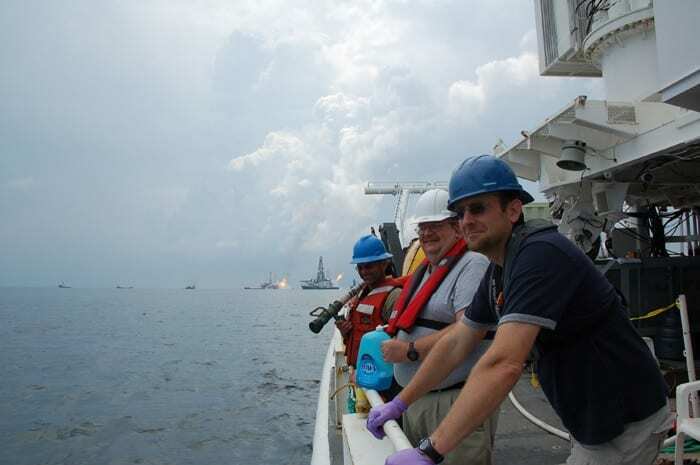 “Our study shows that the dynamic microbial community of the Gulf of Mexico supported remarkable rates of oil respiration, despite a dearth of dissolved nutrients,” the researchers said. Also participating in the study from WHOI were researchers Christopher M. Reddy, Richard Camilli, Catherine A. Carmichael, and Krista Longnecker. The research was supported by RAPID grants from the National Science Foundation.